Firewire Surfboards, the leading surfboard maker in the market, began searching for a modern, flexible ERP when their legacy system couldn’t keep up with their amazing growth. Like customers Superprem, Specified Technologies Inc., and Shoebacca, the Firewire team has found success with Acumatica’s innovative cloud ERP solution. From day one, Franklin Shiraki, Corporate Controller for Firewire Surfboards, knew their low-cost, legacy ERP wouldn’t be able to scale with them. At the time, and over the twelve years they used it, the system handled their basic transaction processing and operated as a company database. But the company thrived and expanded, and they needed a true cloud ERP solution that was cost effective, provided visibility business-wide, and could integrate seamlessly with third-party applications. That’s when they found Acumatica Manufacturing Edition and Acumatica Financial Management. The Firewire team designs surfboards, traction pads, and leashes to “elevate the surfing experience”, but they’re also finding and using new materials and advanced construction methods to create environmentally conscious, sustainable products. And their efforts have paid off. With the addition of a new brand, the eco-friendly company has seen year over year growth exceed 30% in the past, and in 2016, Shiraki knew they needed modern, robust financial management software to keep up. With distribution operations in the U.S., Europe, and Australia, manufacturing operations in Thailand, and selling their surfboards through retailers, the complexity was too much for their disjointed legacy systems. They had no visibility and lacked real-time communication—which resulted in inefficiencies. In fact, the only reason their platform worked for as long as it did was due to the efforts of technology partner Crestwood Associates. And when the Firewire team began researching their cloud ERP options, including SAP Business One, they turned to Crestwood for help. When the Crestwood team introduced them to Acumatica, it was game over. They implemented Acumatica in their six operating entities and gained a multitude of benefits. Firewire knew they had made the right decision by choosing Acumatica’s cloud ERP solution, citing many ways they’ve benefitted. For example, Acumatica’s open platform allowed them to seamlessly integrate with Brandscope, their custom production database, and Verifier tag software, which tags boards through manufacturing. With Acumatica, Shiraki says Firewire has improved their visibility. Having real-time data from all six operating entities has resulted in increased sales through better decision making. They’re finally able to see their operations, finance, and inventory data clearly, and he also says they’ve saved hours—if not days—in lost time due to manual reporting. 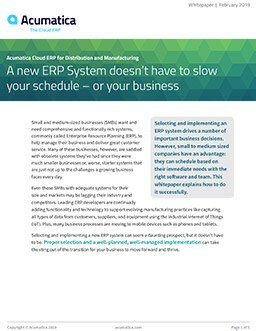 Is Acumatica Manufacturing Edition the right fit for you? “It’s nice to have an ERP solution that is aligned with your own internal views on how to do things,” he says. As the recipient of multiple awards (including highest in usability in Nucleus Research’s 2018 ERP Technology Value Matrix, highest in customer satisfaction out of 12 leading core financial systems in Gartner’s Magic Quadrant report, and the SIIA CODiE Award recipient for Best Cloud ERP solution and Best Manufacturing Solution in 2018, to name a few), we’re ready and able to help you accelerate your success in the cloud, just as we did with Firewire. You can read their Acumatica success story for even more details. You can also reach out to our team with any questions you may have about Acumatica cloud ERP, Acumatica Manufacturing Edition, and Acumatica’s Financial Management edition.